Global Economic Concerns – First and foremost, since it seems to be the only thing that people are talking about at the moment, the Chinese economy is struggling in a big way. In fact, a collapse in the Chinese market led to global market turmoil on the first day of trading this year. Now, more declines from the world’s second largest economy are creating concerns. However, it’s worth mentioning that China isn’t the only economy that’s struggling. In fact, there are several economies around the globe that are having an incredibly hard time. Between China, Europe, Japan, and several other economies, investors are worried about a global economic slowdown that could send the markets on a downward spiral. Oil Is Also Becoming More Concerning – Oil plays a major role in the value of the Dow Jones Industrial Average. After all, the entire energy sector is dependent on the value of oil. When oil falls in value, energy struggles, and as most investors know, oil is in the midst of a drastic crisis. Unfortunately, things aren’t getting much better. As the world continues to produce more oil than it has the demand to cover, the commodity continues to decline in value. This decline is made worse by the fact that the global economy is struggling. After all, when the economy isn’t doing well, consumers look to save money, and the first thing they do is gauge their reliance on oil. As a result of the issues above, the Dow Jones Industrial Average is having one of the worst days that it has had in more than a year. Currently (1:15) the Dow Jones Industrial Average is at 15,849.92 points after falling 529.13 points or 3.23% so far today. Moving forward, I’m not expecting to see much by way of positive news out of the Dow. Unfortunately, it took quite a while for the conditions that caused the index to decline to come to fruition, and chances are that it’s going to take quite some time for a recovery to happen. While central banks around the world have tried to find a remedy to economic blues, they have been unsuccessful. Also, it doesn’t seem as though the value of oil is headed up any time soon. Between these issues, I’m expecting for widespread declines to prove to be the long term trend on the Dow Jones Industrial Average as well as other indices around the world. 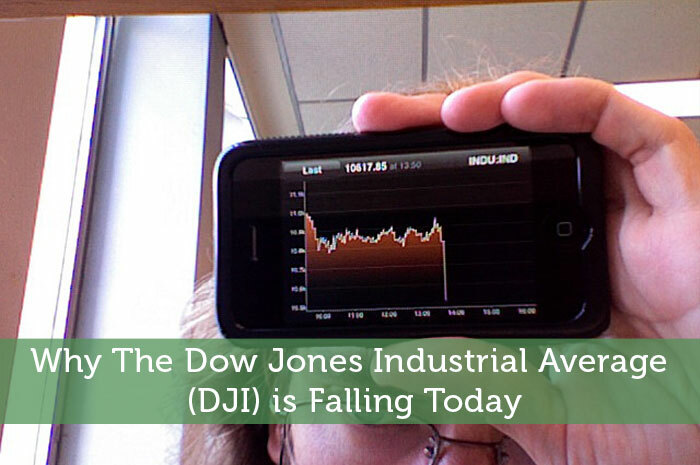 Where do you think the Dow Jones Industrial Average is headed and why? Let us know your opinion in the comments below! I’ve been buying up oil stocks and ETFs, slowing averaging in more and more money. I wonder if Exxon’s famous dividend will be affected. I doubt it, but since I’m in my 20s and in the “accumulation” phase, I love it when cycles bottom out. 20% correction … more upside in the end as low energy prices will prop up the American economy.